This week in my grad class we learned that learning styles don’t exist. Take that in. Challenge it if you will, but after reading multiple articles and watching this particularly convincing TED talk (Don’t Believe Everything You Think), I’m positive that learning styles are not a viable concept. This is the good part: not all our time spent creating activities to reach “different learners” is a waste, because differentiation is good for all students. It may be that one extra example that helps students to make a connection, but having that connection doesn’t make a student a certain type of learner. Another key take-away from this week’s studies was the importance of background knowledge. In the TED talk linked above Dr. Tesia Marshik gives a great example debunking learning styles using a chess board. Subjects were shown images of chess boards and then were asked to recreate the arrangement of the pieces. Those subjects with knowledge of chess pieces and their movements on a board outperformed their peers. This doesn’t mean they are visual learners, it means they know more about chess. However when the pieces were shown at random places on the board that didn’t follow the rules of chess those familiar with chess scored in the same range as those who were unfamiliar. This demonstrates the importance of background knowledge and skills. In applying this new-found knowledge in my classroom I will make sure I’m not just implementing activities for the sake of saying “Oh I’m trying to reach my kinesthetic learners.” I will approach planning from the perspective of looking for additional methods I can use to reach all my learners. I will also be sure to stop saying learning styles and instead call them what they actually are: learning preferences. I encourage you to watch the TED talk. Also I encourage you to keep differentiating. I hope to continue to update this blog with ideas to help you do so in the classroom. This week in one of my grad classes we’re studying the theory of situated cognition (Sitcog). This is a really interesting theory that suggests one can only learn when in the proper setting. That doesn’t mean a quiet learning environment with minimal distractions; it means students should be doing and learning through practice. Sitcog claims that knowledge is not an idea or entity, but an action that can only manifest given specific context. Knowledge is demonstrated with the learner can successful navigate a situation. This goes much further than practicing math facts and demonstrating that one can correctly perform the steps to solving an equation. Sitcog relies on students working through problems, projects, and cases to deepen their understanding in a richer way than any worksheet could do. Students will see value in learning when they can apply it to real-world situations. Yes, these problems are often challenging for students, and in middle school it is especially difficult to get students to learn by doing. Teaching through problem, project, or case based learning is not something that many of my students are used to, but by presenting students with situations that require them to apply knowledge beyond a word problem on paper they are truly learning the material. Sitcog also stresses the role of a learner as an apprentice and suggests that one will learn best through legitimate peripheral participation. Student teaching is one example of this. As a student teacher I worked along side a professional who guided me through what I should be doing in the classroom, offering tips and suggestions. In applying this to the classroom, the teacher becomes more of a coach or mentor to students. It is not the role of the teacher to give answers or provide a step by step solution. This is difficult because as educators we naturally want to see our students succeed, and taking a guiding or questioning role is not always easy. But we also know that seeing students engaged in authentic learning experiences creates an opportunity for students to reach that “ah-ha” moment on their own. This makes a huge difference as opposed to us just telling them what to do. I wanted to try out this theory in my own classroom so I created a problem-based learning activity for my students. We’ve been doing a lot of work with the Pythagorean Theorem, and I’ve been stressing application problems. I keep telling my students that real life will not hand them a sheet of pictures of triangles with missing sides, so they have to get used to solving the tough real-world problems. I really wanted to create an activity that could actually happen, where students could actually apply their skills. Here’s a brief overview of the activity. Students work in pairs to complete a packet with questions and instructions. The object is for students to build a wheelchair ramp so their friend who was recently injured in a car accident can come visit. Students are given ADA specifications and a scale model of the ramp they will need to build. After calculating how much wood they needed, they visited Lady Balsa (me in ridiculous safety glasses that I could have borrowed from Lady Gaga hence the name) at Lowes to get their wood. Lady Balsa and the Cutting Table at Lowes. Note: This is where I really stressed students as problem-solvers. I told them their teacher was not available as they were to imagine they were at home working through this problem. Lada Balsa could really only help them with cutting wood at Lowes (I also said she charged double for at-home consultations). By creating a character for myself, I was able to step out of the teacher role and observe students in learning. Of course I wasn’t able to complete take myself out of the picture, but it was great to see students run with my alter-ego and try to work through the problem on their own. They were able to select the wood (light or dark), and then it was cut to their specifications. After groups finished we discussed the different ramps and where errors happened, and the different ways to solve the problem. This went way better than I had anticipated. I expected students to struggle with knowing how to set up their measurements. There was a lot of great math in this activity. Students had to use skills to measure, solve ratios, compare slopes, scale models/drawings, and of course the Pythagorean Theorem. I did try to make it a fairly easy problem as this was the first time I was implementing this sort of activity. The students enjoyed it so much that commented how they wished we could really go to Lowes and that I should dress up like other people more often. I’m definitely wanting to try more of these sitcog activities in the future, and as students become more acustomed to doing these activities I will increase the level of difficulty. I encourage you to try out some problem-based learning activities in your own classroom. Check out Yummy Math to get you started! Some of the finished ramps. You can see the third ramp miscalculated by asking for too short of a length, and the ramp in the back was far too long. Do you ever feel like teaching is a dog and pony show? I know I do. Wouldn’t it be great to have a classroom full of students who come in prepared and ready to focus only on the lesson you’re presenting? All eyes are on you and they’re only thinking about the math not who Bobby was sitting next to on the bus, or if Lebron’s going to score 60 points tonight. But the reality is we’re competing with so many factors for our students’ attention. Some of these factors we can’t control, but it is important that we try our best to hold our students’ attention. This week for my grad class I read a lot about memory and how it’s related to attention. In her book “Human Learning,” Jeanne Ormrod states that attention is “critical for long-term retention of information.” We often say to our students when they miss something “Were you paying attention?” but we need to make sure we use strategies to ensure they are paying attention. I know that it’s hard to make every lesson the most exciting lesson, but I want to share with you a few tricks that have worked for me. A lot of time when students walk into my room they are carrying what appears to be the entire contents of their locker. They get locker breaks, I don’t know why they need to carry around everything. I find their gigantic binders and reading books can be a big distraction. “Look at this huge packet of work you get in Social Studies.” “Isn’t this narwhal I drew on my binder hilarious?” When my students come in each period there are directions on the board for them to follow. They almost always start with “Clear off your desk except for… ( a list of what they need to start class).” I really stress these directions at the beginning of the year. I will even show pictures on the board of what their desk should look like. I find I rarely have to say “Put that away please,” or take an item because students just know it’s not supposed to be on their desk. Students hate to be called on in class if they’re not paying attention, and truthfully I don’t love calling them out. I’ve tried the popsicle sticks, but wanted more student involvement. I tried letting the students choose the next person to answer. When going over answers in class, I’ll choose the first person who volunteers, then that person chooses the next student. Then the second student chooses the third and so on. They are not allowed to vie for selection out loud and students have to pick a different person each time. This method has increased participation in the beginning (because if they’re first they can get it over with), but also attention has increased because they know a friend might call on them. Even after they answer they pay attention to see if someone will get caught not paying attention. Also it’s taken some responsibility off of me and I can circulate while they answer. This one definitely doesn’t work in every classroom. Some kids just can’t handle it. It’s all about setting up parameters for it. If I find my kids are tuning out, or getting out of control I will say “Awesome Possum.” This is their clue to play dead. This usually involves flopping over on their desk, and there shouldn’t be any talking. I try not to say it when they’re standing so I don’t have kids throwing themselves on the floor. They do not like to be the last one to play dead. So it usually gets quiet pretty quickly. Then I say “Awesome job Possums”, we let out a few giggles at the last ones to play dead and we get back to work. It’s a nice brain break, and it gets everyone back focused on me without calling any one student out. It’s really effective for coming back together after group work, but I like to randomly throw it into instruction to get their attention. But like I said, some classes can’t handle it so we don’t play. There are a lot of other great strategies out there for getting and holding the attention of middle school students, but I gave you these four because they are easy to incorporate and don’t require any singing or dancing. I know there’s not a lot of time in our busy schedules to create amazingly engaging lessons every day, but if you’re bored teaching it, chances are they’re bored learning it. It’s okay to say to students “This may not be the most exciting lesson, but we’re going to get through it so we can apply it to basketball (or some other more exciting topic your students are into).” We have to work at creating memorable learning experiences for our students, and that starts with getting their attention. Do you have any great strategies you use for getting attention in your class? Share in the comments! Student desk during activity with question card, work sheet, and puzzle pieces. Do you ever get tired of giving students endless practice problems from textbooks or worksheets? I do! A friend of mine that teaches remedial math shared this activity with me, and I want to share it with you all! My 8th graders love it, and I love it because they’re practicing their facts, working collaboratively, and I’m able to do a quick check to see if they’re getting correct answers. I feel like this activity is really easy to explain in person, but my typed explanation might sound like this is a complicated activity. It’s not! Hopefully the pictures will help. 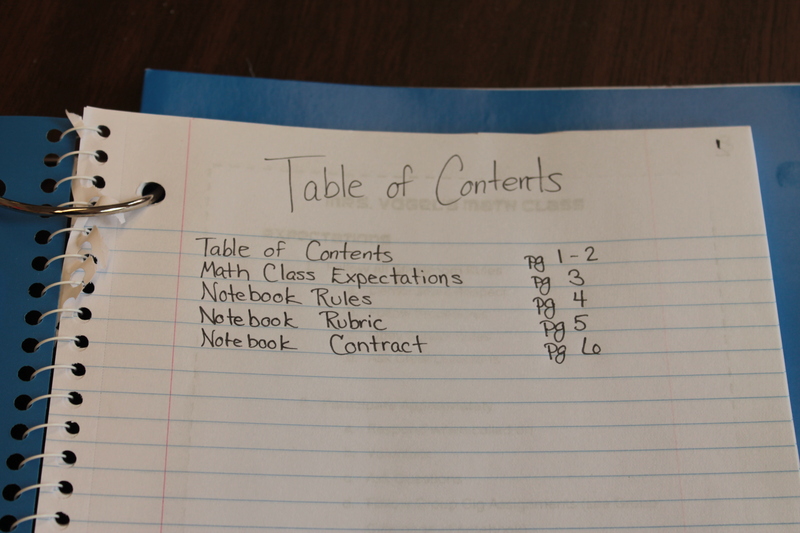 Here’s the gist: Students are given a blank sheet that’s separated into 4 boxes. On a table in the front of the room I have divided puzzles and cards. Each group gets a card with some problems on it. They all solve the problems on their sheet in the box with the picture that matches the card. When they’ve decided as a group that they have the right answers, they send one person up to the table with their answers. I check their sheet. If it’s right, they get some puzzle pieces and another card. They start the next card in the corresponding box. They must send a different group member up for answer checks each time. On completing the fourth card they get the rest of the puzzle pieces. Usually the first group to complete the puzzle wins a prize. Front table setup during the activity. The first card they get without pieces, then as they get cards right they get new cards and pieces. The last pile is the pieces they get after completeing the fourth card. 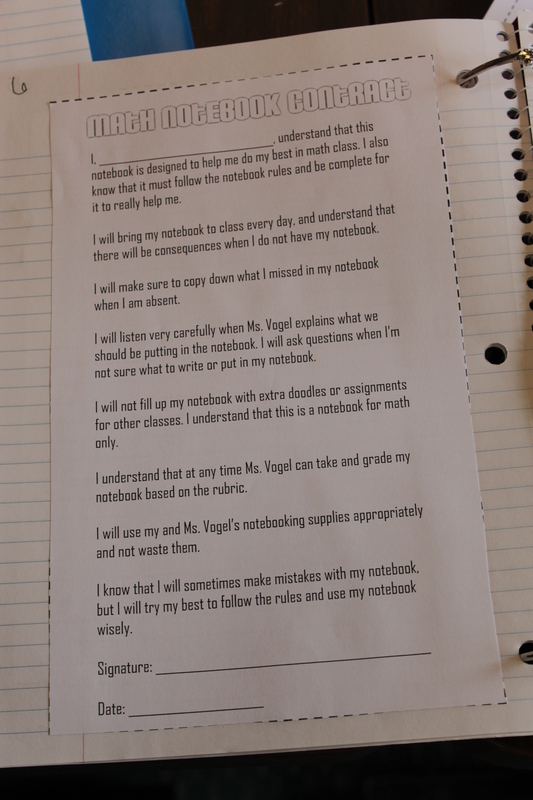 When preparing the activity I make copies of the worksheet for each student. Then I print the problem cards on cardstock. I use a different color for each group. This helps me to keep things organized when handing out the pieces. I got 24-piece puzzles from the Dollar Store. This works perfectly because I can give them 6 pieces for each correct card (MATH!!). I got different puzzles so the pieces don’t get mixed up. The kids love the Jake and the Neverland Pirates puzzle. I don’t show them what their puzzle looks like ahead of time. That would be too easy! I usually use this activity for review. I’ve even used it in my algebra class, where each card was one problem (Like writing linear equations from two points). I typically give students 20-30 minutes depending on the problems. As groups finish they’re allowed to start on their homework. Bonus: Here’s a link for a free download of the cards!! The cards here are exponent rules, but feel free to use the blank sheet to make your own questions. I’d love to hear from you if you use this in your classroom. It really easy a cheap and easy activity with minimal cutting. Summer is officially over! In my mind at least. I know a lot of you are probably already back in session. Some of my Indiana friends have already had Meet the Teacher Night! Our first student day is a week from today, but I went in today to set up some things and I’ll be in the rest of the week. I’d love to hear from some of you tips on Meet the Teacher Night. This seems to be such a nerve-wracking night for many. A weedle helping me with some worksheets. Back to school has dual meaning for me this year. Not only will I be returning for a second year at my current school, but I’m also attending grad school at University of Connecticut! I’m so excited to be learning all kinds of new things and meeting fellow educators. My blog is going to change a little as I start to blog not only about what’s happening in my classroom, but also my grad classes. It’s going to be a tough year balancing my 8th graders and a full course load each semester, but I’m looking forward to the challenge. My graduate degree is going to be in Educational Technology and we’ve been talking a lot about augmented reality and PokemonGo. Of course I’ve been playing, and I’m really anxious to see if my students are into it. I can’t wait to meet my students, and I cannot wait to share some of the things I’m going to be doing. I’m slightly obsessed with alliteration, and I really want my group work/centers to be successful this year. Keeping those two things in mind I created a system that I hope will be really beneficial for group work this year. Yesterday I described the trays I use as notebooking supply stations. On these trays I’ve taped four numbers, and each of the four numbers is a different color. The numbers are how I give new seats and randomly call on students. The colors are for group jobs. I also have a poster in the front of my room with job titles and colored arrows that match the colors on the tray numbers. I rotate the arrows each morning. As you can see from the photo my job titles are Discussion Director (I feel like I stole this from lit circles), Class Communicator, Inquiry Investigator, and Materials Master. Since I had all these alliterative titles, I felt like Group Job Titles just wasn’t cutting it. So that’s why I’m calling them my Group Gigs. This student is essentially the leader of the group. He or she will always go first, and lead the discussion. He or she will also make sure all group members have completed their task before moving on. I also am going to have the Discussion Director go first when playing games or centers. This student will report group findings to the entire class. 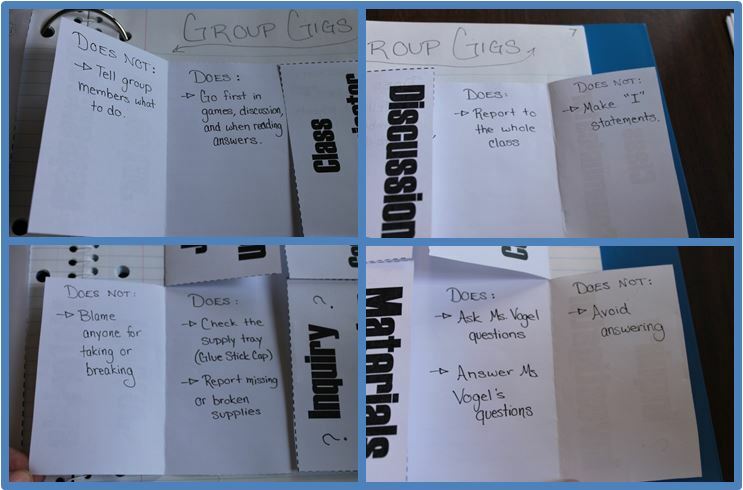 So after they’ve had time to work in groups, when we bring it back to the whole class, the Class Communicator will share his or her groups’ answers or decisions. (This prevents the same person from always sharing). This student’s job is all about questions. It’s almost like he or she is the group liaison with the teacher. If the group has a question, the Inquiry Investigator seeks me out to ask the question. Then he or she will report back to the group. Also if I’m checking in on groups while they are working, the Inquiry Investigator is responsible for telling me how the group is doing. This is different from the class communicator. The Inquiry Investigator communicates just with me, not with the whole class. The student who is the Materials Master is in charge of making sure all the supplies get back into the tray. He or she is also responsible for letting me know if materials need to be replaced. The Materials Master is the only student who has a job every day. If we’re not doing group work for some reason the other three get the day off. 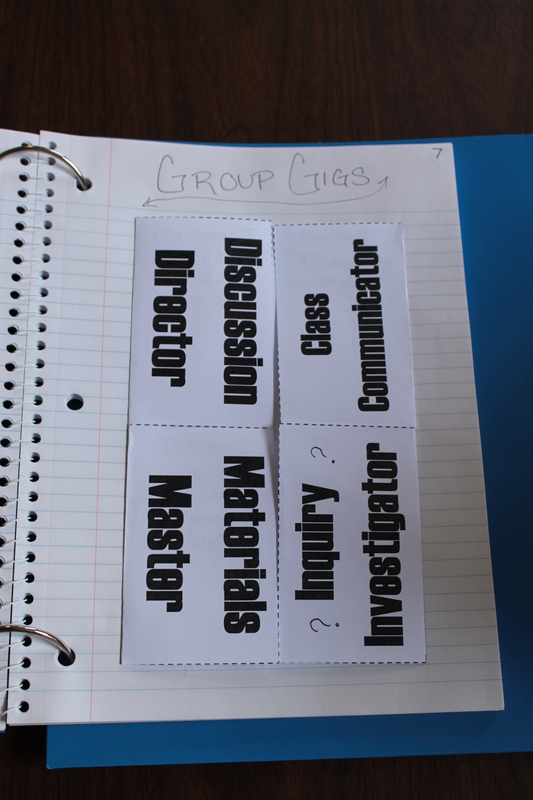 I designed these groups so that each student would have some accountability. I’m really looking forward to implementing them. To introduce the jobs to the students we created a page in their notebooks with Gig Descriptions. I had students copy me, and we wrote down what each Gig “Does” and “Does Not”. We discussed each job and several scenarios. We also spent some time talking about what “Inquiry” means. Say you give your students 5 problems to work on in groups. Everyone would start working on the problems 1 by 1. When the Discussion Director notices everyone has completed the first problem he says “I got 17 for problem one. Did anyone else get a different answer?” They all agree except for one person. That student explains why her answer is correct. Now the group cannot decide who is right. They send the Inquiry Investigator to me so I can check their work. They move onto the next problem. Meanwhile I’m checking with another group’s Inquiry Investigator to see what his group got for problem 1. After I’ve given the groups time to finish the five problems, and I’ve checked in with every Investigator, I bring the whole class back together. I start by asking group 1’s Class Communicator to share their findings for problem 1, ask the other Communicators if they got the same or different answer, and then continue to check answers. At the end of the class I remind the Materials Master to check the supply tray and report any issues to me. 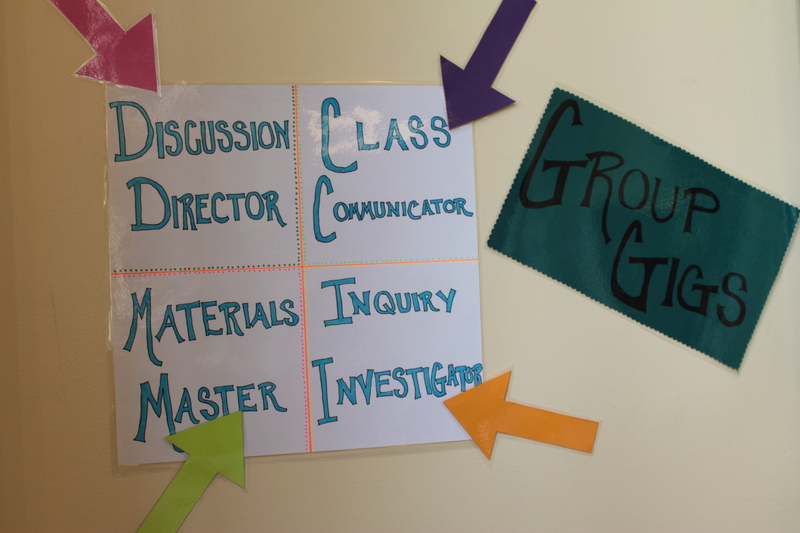 How do you use group jobs in your classroom? Hopefully you can use some of my ideas here, but feel free to adjust for your needs. Hello teaching world! It’s been a while. I assume like me, everyone else is already back in their classrooms. I’m looking forward to another year of teaching math. I’ve made it a personal (and fairly professional) goal of mine to blog more. I’m hoping for at least a blog entry every Tuesday. Hopefully you (my wonderful followers) will find this helpful. Today’s entry is about notebooks. 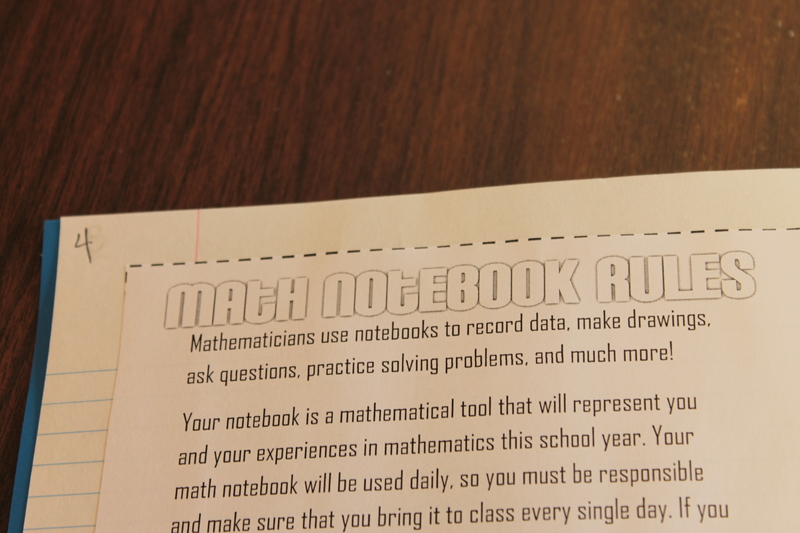 This year I’m going to try my own version of interactive notebooks with my kids. Last year my students really struggled with organization. I wanted to come up with a better system for them. After talking with my team (the english, social studies, and science teachers), we decided on a system that we hope will be beneficial to all of the students. Each class is color coded, math being blue. 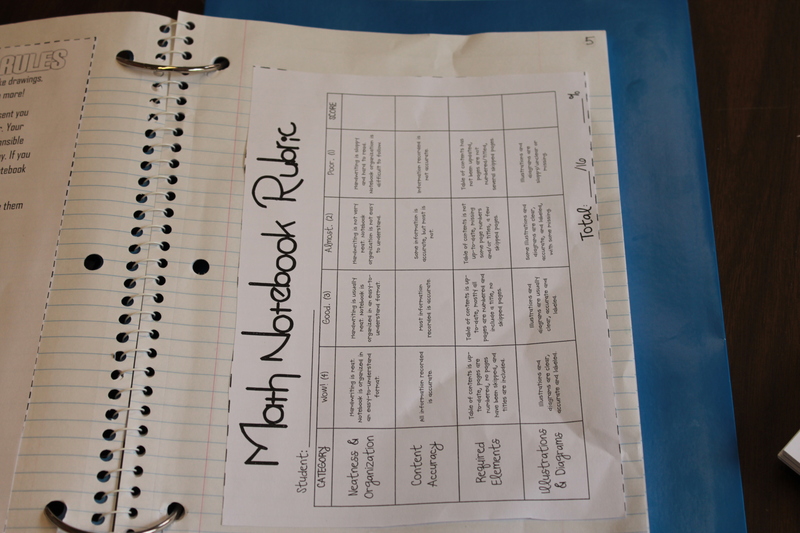 Students were instructed to get a blue, spiral notebook and a blue 3-hole punched folder. Then I gave each student two 2-inch binder rings to clip the two together. We’re also going to attach their workbooks with the binder rings. 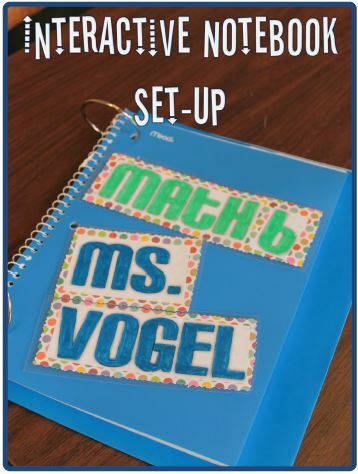 Each class has a different colored folder/notebook combo. Red – Language arts, Green – science, Yellow – Spanish, and so on. This eliminates the gigantic trapper keepers and gives the kids places for each classes materials. Being an organizational freak I looooove this system. It’s also so much less for the kids to carry. We also had them put together a “homeroom” folder. This is two binder rings with their school planner, a folder for papers to go home to parents, and their pencil pouch. This homeroom folder goes with them to every class. The main picture of this post is one of the examples of what students will be using in my class. These are the items I started my notebook with. For more information about each element, read on! I’m going to have students number the pages in their notebook and create a table of contents so they can find the things they need. I started setup by having the students open to the first page in the notebook and write “Table of Contents” at the top in the margin. Then we numbered the page in the upper right-hand corner. Then we listed the items that we were going to put in the notebook. I had them write a 2 in the upper left-hand corner on the back of page 1. We left this page blank so that we can write in more items later after page 1 is full. I had typed up my classroom expectations and grading policies for the students. I wanted them to keep this in their notebook, so I decided to put it first. To create these documents I typed them in Word, and used wide margins in the page layout section. 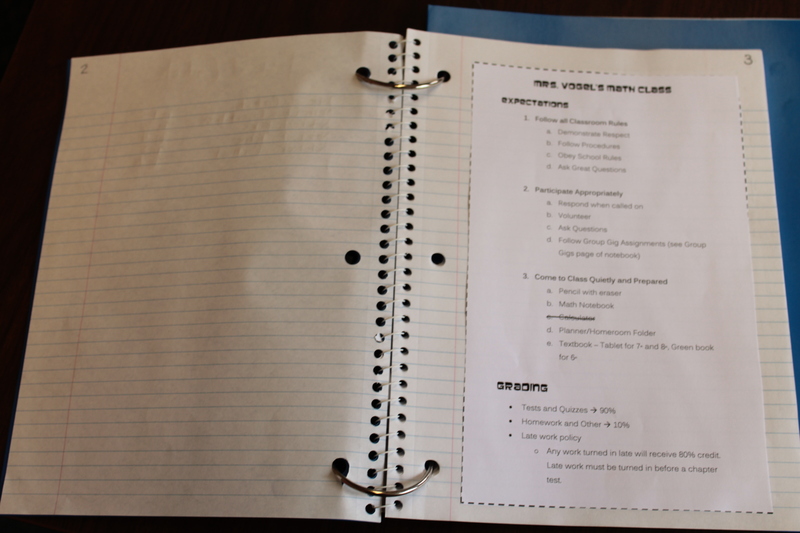 This way students with smaller notebooks can still fit the entire sheet in their notebook. Then I put up a dashed line border, so they would have a guide to cutting out their sheet. I had students use their method of choice today – glue stick, tape or stapler. I found tape to be the best, but I feel like we’re going to go through a lot of tape. So I may change my mind on that one. I had to show students the best way to glue stick a rectangle (ie. don’t coat the entire back of the paper with glue). The stapler was okay, except I only have mini-staplers for the students to use so it didn’t always reach to the paper. Hopefully everything stays in. 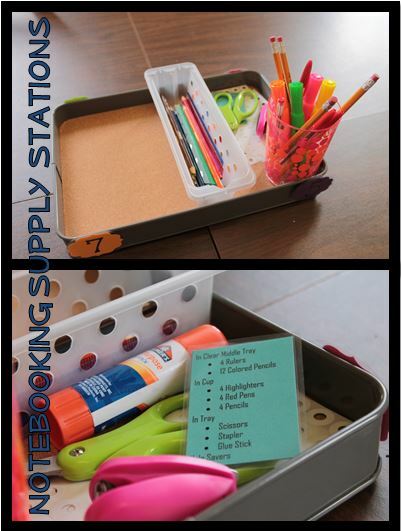 While I’m on a roll here I’m going to tell you about the notebooking supply stations I created. Students were told to keep scissors and tape or glue stick in their pencil pouches. You and I both know that’s not always going to be the case. So I made little stations for each group of four. This wasn’t super cheap, but I know it will save me (and the students) headache in the long run. I glued a cup and basket down to the tray. My plan is to use the empty half of the tray for papers that students need to put in their notebooks. I put the necessities in each tray, and then typed up a list of what should be in the tray at all times. You can see this in the picture below. Each day a different student in the group of four will be responsible for making sure the supplies are all there. You can read more about that in my future blog post. Shew! That was a long one. Feel free to comment with your suggestions and questions. I love hearing from everyone. I hope everyone’s off to a great start!